In islet transplantation, islets are taken from a donor pancreas and transferred into another person. Once implanted, the beta cells in these islets begin to make and release insulin. Laboratory personnel use specialized enzymes to remove islets from the pancreas of a deceased donor. Islets can be kept in culture a couple of days, allowing for selection and admittance of a suitable patient. During the transplant, the radiologist uses ultrasound to guide placement of a catheter through the skin, the liver parenchyma and into the portal vein. The islets are then injected through the catheter into the liver. The patient will receive a local anesthetic or general anesthesia. If anatomical or other problems occur the transplant can be done through a small abdominal incision. It takes time for the cells to attach to new blood vessels and begin releasing insulin. 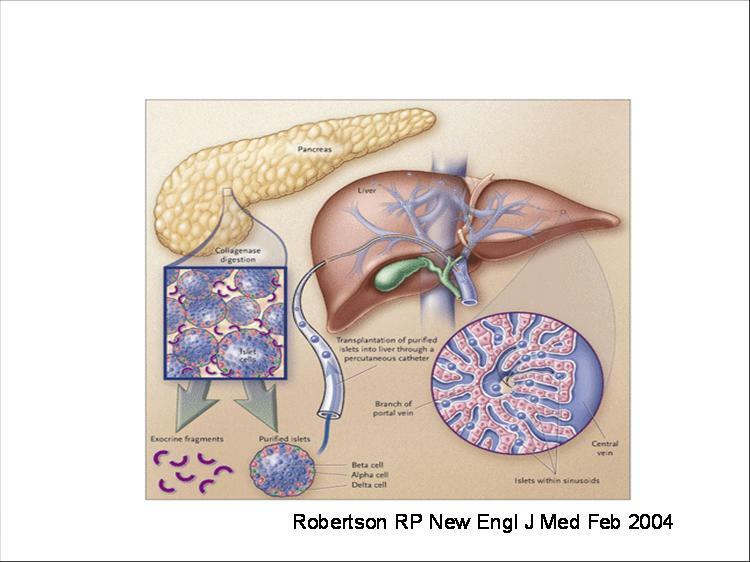 It is vital that the islets are able to “rest” during this period and insulin will be needed at least until engraftment in the liver is completed (> three weeks). To avoid rejection of the transplanted islets immunosuppresion is needed. In contrast to other transplantations steroids and lymphocyte depleting antibodies are avoided in the protocol. Emphasis is put on mycophenolate mophetil (Cellcept®) or sirolimus (Rapamune®) combined with a low-dose calcineurine inhibitor (tacrolimus (Prograf®) or cycloporineA (Sandimmun Neoral®)) and a interleukin 2 receptor blocking antibody (daclizumab (Zenapax®)) used only in the peritransplant period. <?xml:namespace prefix = o ns = "urn:schemas-microsoft-com:office:office" />Side effects of immunosuppressive treatment includes nephrotoxicity, infections and an increase in the risk of getting cancer. Patients are closely monitored to avoid these risks and to detect any unfavourable signs early. The islet transplant itsef is a minor procedure, although partial portal thrombosis and bleedings have been reported. Earlier when larger volumes with more exocrine tissue were transplanted a few cases with total portal thrombosis occured.